If your school has a free or reduced lunch rate of 50% or higher, the Greenway Trust may be able to pay for your field trip and/or stewardship event bus(es). Contact ‘becca.kedenburg (at) mtsgreenway.org’ to learn more. 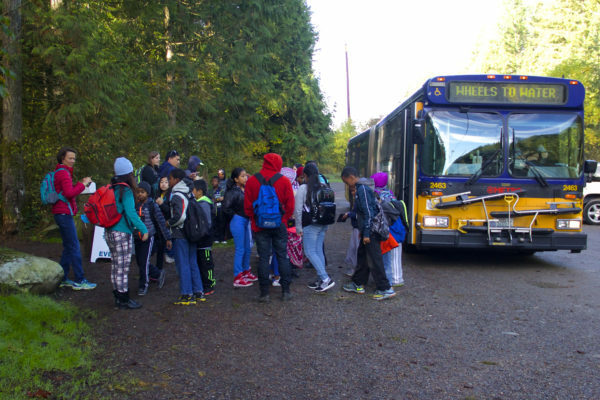 Each year King County provides a limited number of public buses through their Wheels to Water program to transport classes to field study trips. To be eligible for a Wheels to Water bus, schools must have a free or reduced lunch rate of 25% or higher. If you are interested in using a Wheels to Water bus, please contact Becca Kedenburg as soon as possible.